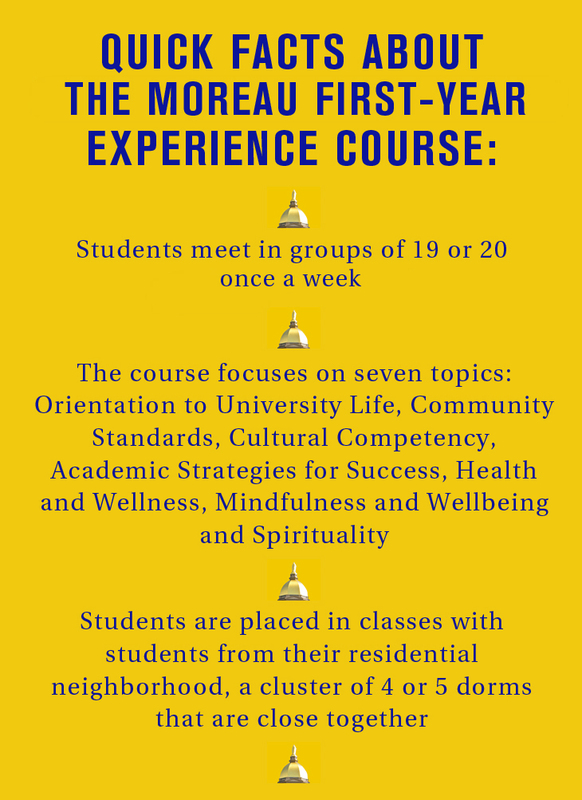 All Notre Dame freshmen will take the new Moreau First-Year Experience course during this school year. The course places an emphasis on the holistic growth of the student and aims to ensure a seamless transition for incoming students into every facet of the Notre Dame community, especially experiences in the classroom and residence hall. Maureen Dawson, associate professional specialist for the First Year of Studies, said the weekly course of about 19 or 20 students is meant to create a platform for conversation about the college experience. “The long term goals for the course are actually coincident with the short term goals for the course: to give students a sense that they are entering a supportive community and that they have the time and space to think about their work in a very holistic way, integrating their academic and residential experiences,” Dawson said. Dawson said transitions are always difficult, especially in institutions with deep traditions. “One of the reasons for making the change at this point was a growing concern for students’ well-being, especially their emotional health,” Dawson said. “I think that’s what shifted the paradigm from the excellent work in the physical education department to this current program. Dawson said the curriculum design for the course began with discussions back in 2014 and was approved at that time. The course is a credit-bearing course graded in the fall and spring. “In the course of the fall and spring semester, we are looking at a series of topics spanning 13 weeks each semester,” Dawson said. “The topics were formulated from this originating committee and there are seven broad areas to be covered: Orientation to University Life, Community Standards, Cultural Competency, Academic Strategies for Success, Health and Wellness, Mindfulness and Wellbeing and Spirituality. Dawson said there is value in the repetition of topics due to the fact that a student in week three has an entirely different outlook than a student in week eight or week 13. “A topic like cultural competency is treated early in the semester, at mid-term and at the end of the semester so that students get a sense of what culture is, how identity plays into group dynamics and how to engage with difference on campus. Topics repeat and refer back to each other over the course of the year,” Dawson said. “When topics are treated in an iterative fashion, you get into them a little more deeply and you get to understand them a little bit more,” she said. Dawson said the main focus of the experience is to integrate academic life, residential life and everything else that happens on campus. “We looked at where students lived on campus, and we identified seven residential neighborhoods that were clusters of four or five residence halls,” Dawson said. “Sections of Moreau are populated with students in the same residential neighborhoods. Freshman Kathleen Ryan said she liked the idea of getting different perspectives from a wide array of students. Ryan said she appreciates the sense of unity the Moreau course creates as a required course for all freshmen students. Richard Meland, another freshman, said he enjoyed the portion of the class he has attended thus far. Meland said he believes everyone should learn how to swim, a part of the physical education program that is not replaced by any portion of the Moreau course. Maureen Dawson said she and her colleagues in the First Year of Studies are very open to student feedback.